We are hiring! We have three Associate Editor positions opening up for 2019. We are looking for one new Associate Editor to start as soon as possible in 2019 and two new Associate Editors to start in late spring or summer 2019. All three jobs are posted on MathJobs.org (of course!). For each of the positions, the successful applicant will have mathematical breadth with an interest in current developments, and will be keen to learn new topics in pure and applied mathematics. Candidates are expected to have a doctorate, plus several years of relevant experience post-Ph.D.
Job #13067: [To start as soon as possible in 2019.] The new editor should have expertise in combinatorics and related areas. Job #13068: [To start in late spring or summer 2019.] The new editor should have expertise in mathematical physics and areas of analysis. Job #13069:[To start in late spring or summer 2019.] The new editor should have expertise in number theory and related areas of algebra, analysis, and geometry. 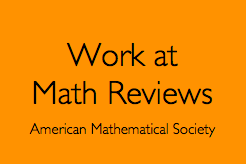 Mathematical Reviews is a great place to work. You get to do something important and useful. You would also be working with great people. A list of the current editors is here. And here is a picture of some of us observing the eclipse in August 2017.